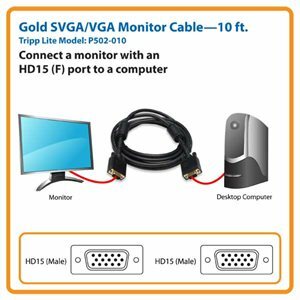 Tripp Lite's 3.05 m (10-ft.) SVGA/VGA monitor replacement cable is the gold standard in video cables. The mini-coax (RGB) and paired video wire construction delivers superior signal quality. Gold plated connectors and gold plated copper contacts ensure excellent conductivity. Double shielding (foil and braid) provides maximum EMI/RFI protection. Both high density DB15 male connectors are molded and have integral strain relief to ensure they last a long time. The Tripp Lite P502-010 VGA Coax Monitor Cable (M/M) is an excellent replacement for an existing cable that is lost or worn out. Compatible with PCs and Macs equipped with a 15-pin female SVGA or VGA port, it supports high-definition resolutions up to 2048 x 1536 for realistic, razor-sharp video. This 10 ft. molded cable features premium foil and braid shielding, as well as mini-coax (RGB) and paired video wire construction, to deliver top-of-the-line signal quality and protection from EMI/RFI interference. Gold-plated HD15 male connectors with gold-plated copper contacts ensure excellent conductivity. Integral strain relief ensures the cable and connectors last a long time. The P502-010 comes with a lifetime warranty. It’s manufactured in compliance with strict RoHS specifications, reflecting Tripp Lite’s commitment to environmental responsibility. Your Tripp Lite cable will be shipped to you in its original Tripp Lite packaging (poly bag with Tripp Lite logo; see photo). This is your assurance that the cable you purchase will deliver the superior performance you expect. And if you don't see this packaging, it's not a genuine Tripp Lite cable!